Many many thanks to Raffles Marina and family Deborah Bruggmann who made our stay in Singapore a highlight! Welcome to our new supporters “SWISSPRO” and “Huber + Suhner” optimizing the drinking water system and the electirical cabling system on Pachamama! What a great arrival in Singapore on the 10th November 2009! We had hardly fixed Pachamama in the Raffles Marina as already the employees of swissnex with the director Suzanne Hraba-Renevey showed up in order to give us a warm welcome with an excellent lunch at the Marina Bistro. Swissnex Singapore is an information, coordination and networking platform of the Embassy of Switzerland, bridging knowledge and competences in science, education, art and innovation between Switzerland, Singapore and South East Asia. The marina, which is located at the west coast of Singapore, is an excellent place with all facilities you need to have a boat berthed. A huge thank for the great hospitality and generosity to Prakash Reddy from Raffles Marina! 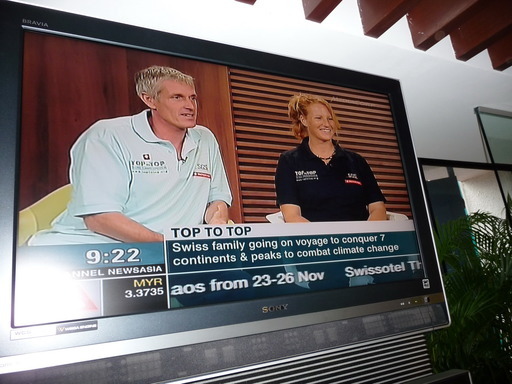 We did not really have time to relax – a tight program including presentations at schools and universities, boat visits, events with sponsors and interviews with newspapers and TV channel were organized by swissnex for us. These 3 weeks in Singapore were as busy as the town itself! In just 150 years Singapore has grown into a thriving center of commerce and industry. And incredible, too, that there was once a rainforest with orang utans, tukans and white tigers! These animals and plants can still be seen at the beautiful zoo, the botanic garden and the birdparc. Singapore is the busiest port in the world with over 600 shipping lines sending supertankers and containers and is also one of the most important financial centers of Asia with more than 130 banks. It has endless shopingmalls, traffic, people, building sites. Not easy to get used to this fast and busy lifestyle! Our first exciting event was the dinner at the residence of the Swiss Ambassador Joerg and Madeleine Reding together with the consul and the Ambassador of India. 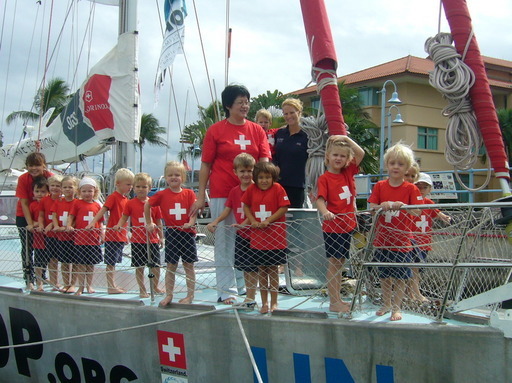 After an interview at Raffles Marina for an article in the magazine „Nautic” we went the following day, the 17th November, to the Swiss School in order to give a presentation in front of the pupils and parents. They even visited us on the boat. This excellent school under the direction of Hans Huerlimann and Bjoern Egli was founded in 1967 with 20 students. 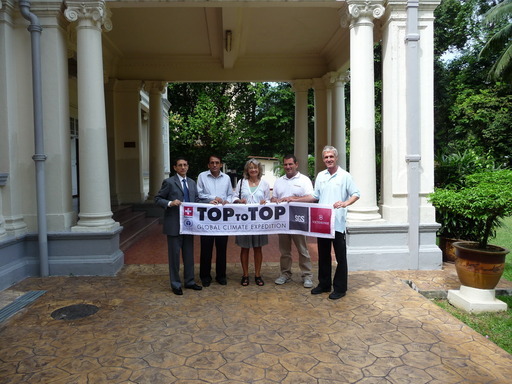 At that time nobody could have foreseen the incredible development of Singapore nor the progress of the Swiss School. Today 31 teachers are looking after more than 190 students. Salina and Andri had the great opportunity to visit the Kindergarden during several days. Thanks a lot to Hans Huerlimann, Bjoern Egli and the wonderful teacher Wendy. In the afternoon Dario gave another presentation in front of 250 students at the Nanyang Polytechnic organized by James Soh from NYAA Council. The students were very interested and the discussions about climate change continued even after the talk. On the 18th we had the great opportunity to join the Fair of the „Clean Energy Expo Asia” as visitors and guests of swissnex and with a presentation of Dario about Toptotop Global Climate Expedition organized by Jacqueline Kaiser from swissnex. 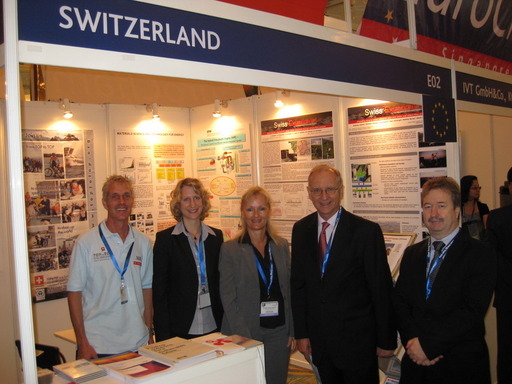 At the Swiss booth swissnex presented innovative cleantech projects from Swiss universities and research institutes. Katadyn/Swisspro organized the next day a big event for 150 persons from Singapore Polytechnic in collaboration with Singapore Polytechnic. The Swiss Katadyn Group is the world’s Number One for individual water purification systems and products, with a global market share exceeding 50%. We are very thankful to Marco Preisig from Katadyn Singapore that we got the new purification system for Pachamama. It is of big importance that we have good water on Pachamama, especially when we soon will be traveling in India. 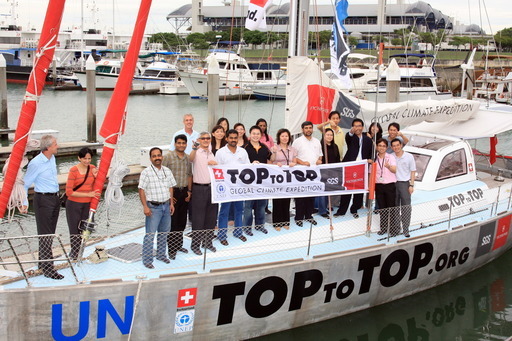 One big event chased another: SGS, another big sponsor of the Toptotop Global Climate Expedition organized an event at Raffles Marina with a boat visit on the 20th November. SGS (Société Générale de Surveillance) is world’s leading inspection, verification, testing and certification company with 1000 offices and laboratories globally and 56’000 employees, including engineers, doctors, chemists and inspectors, founded in 1878 in Geneva. Between these events June, an independent writer was filming on Pachamama in order to propose a new environment show in Singapore next year. On the 23rd Sabina and Dario were at the studio of Channel Asia News giving a live interview on the Primetime Morning Show – Only arrived one minute before the show started this morning was quite exciting for all of us. Thanks to Joanne Leow Chuang Ching for the very well done trailer. 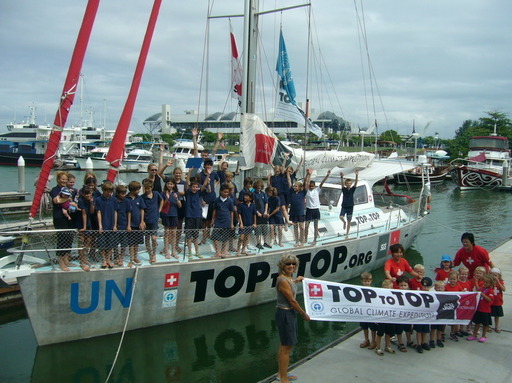 At the same day delegates from different Swiss Associations and Singapore environment group representatives visited the boat at Raffles Marina and Dario gave another fascinating presentation. After the talk we could all enjoy an excellent dinner organized by Peter Zimmerli of the Swiss Embassy. Many thanks to the staff of the Indian Embassy for the efficient work to get all our visas. 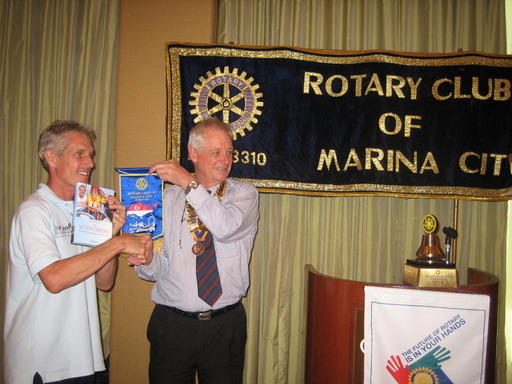 And last but not least Dario got invited to the Rotary Club of Marina City where he told the Rotarians about the expedition during their lunch meeting before setting sails for Langkawi/Malaysia the next morning. Welcome to Matteo Miceli joining us today for the trip to Everest!